There’s nothing like a large get together to enjoy sports and movies. Those times that families and friends join together to cheer on a sports team or against one another or fun parties where movies rule the night. Casa Vento is all about football games and ice hockey and we watch lots of it and have lots of friends over to cheer our teams on and I have a room of armchair coaches that rule the world. Did you know the best way to enjoy sports and movies in a room is by having the right chairs to sit in and providing great food. Great snacks are a must, fun friends that get into the game, call out the bad plays and cheer for the good all are requirements, but there is more to a great gathering. In fact the best way to enjoy sports and movies in home will surprise you. Let’s lavishly live entertainment out loud and uncover the best way to enjoy sports and movies in your home so you can have a rocking party too! Bigger is better and anyone that tells you it’s not just have television envy. Just saying. 77″ is better because everyone in the room can see it. How could you not? Calling all those who love sports, gaming. Or are you a home theater enthusiasts with the latest smart technologies? If you are about parties, gatherings, fun time and you love movies and sports, check out the latest in technology from Best Buy and LG. Before Big Game Day, and before all the new movie releases happen, it’s time to bring the movie theater experience home. You can if you have the new 77″ LG OLED 4K TV . Its advanced HDR enhances each scene to 4K quality, and its Intelligent Processor maximizes picture quality by producing images with rich colors, sharpness and depth. You can enjoy a premium cinematic, home theater experience with this big screen LG OLED TV 77″. Allows you to truly immerse yourself into movies, tv shows, sports, and more for an unmatched experience in 4K. The larger screen brings more immersive experience. 4K is everything now, so watch those 4K movies and TV shows in gorgeous Ultra HD level picture quality because you can! The 77’’ class LG OLED C8 TV provides a premium cinematic, home theater experience with the big screen. When you want to feel like you are there and truly immerse yourself into movies, tv shows, sports, this is the choice television. In fact, it provides an unmatched experience in 4K. However, I realize that some of you out there don’t want a 77″ television so there are also 55″ and 65″ inch screen classes available for you. For Team Vento, it is ‘Go Big of Go Home’. More faces watching television equals a bigger screen needed. We all want the same experience, so the vantage point seating does not matter. Bigger is our choice, what’s yours? . Oh it’s thin and big, what a combination. But there’s more, keep reading, this just gets better and better! I love new technology and a room filled with the best! It’s all here. You are staring at the side view of the LG OLED TV. It’s so thin!!! Let me break this down a bit for you. LG TVs with AI ThinQ® has the Google Assistant built in, so you can control compatible smart home devices using just your voice. This really is a great way to be in control. Create a center for your smart home and beyond. Plus it works with Amazon Alexa devices*. Have you ever been laying so comfortable that you don’t want to move to even find the controller for the television? Don’t worry because your voice commands the TV. You control your TV with voice commands. Commands from changing picture settings (movie mode, game mode, sports mode etc. ), volume of tv, searching for shows and movies, control compatible connect home devices. Get ready, there’s more. In fact, this allows for control of TV and connected devices with the power of your voice and without disrupting your movie watching experience. This smart TV also allows you to launch apps like Netflix, Hulu, and more. No matter what angle you look at, it’s perfect. There can be a lot of people in the room and you still all have the best view. Color is rich, and the size is perfect. Fill a room with laughter, screams, cheers, whatever, but make sure this TV is in there first. Keep reading! Did you ever notice that when color is brilliant during a movie it makes the experience so much better? The LG OLED TV gives Perfect Black & Intense Colors. Here’ the why. Each of the 8.3 million individually lit pixels of the LG OLED TV with AI ThinQ brightens, dims or powers off completely. This is the piece your room needs. LG OLED TV with AI ThinQ® has a head-turning design that elevates a room’s aesthetics while complementing any home décor. Truly, it’s sleek, incredibly slim form factor is ready for unobtrusive wall-mounting or tabletop placement. 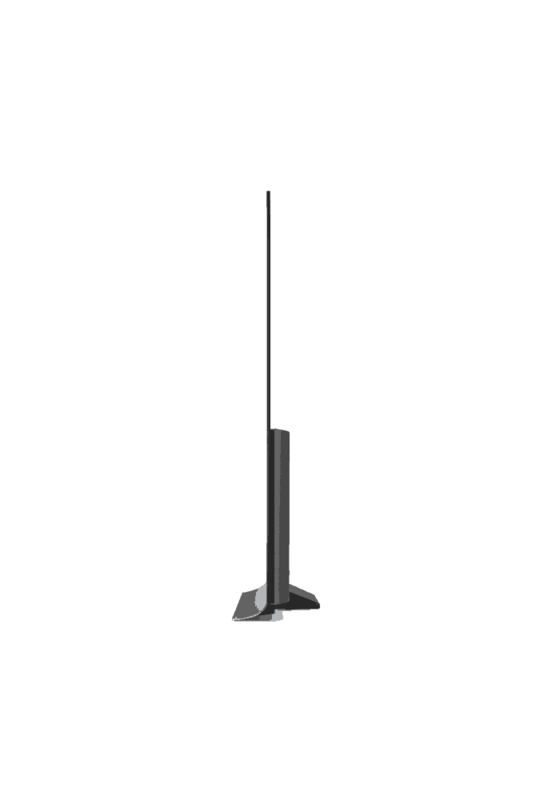 Slim is best and this television is slim, which of course translates to a room that looks pulled together and updated. I love the fact that big wall space needs big something and this is the something to fill it perfectly. It’s a functional piece in a room that centers it, and brings everyone together! LOVE! Before I forget, we gotta talk about sound. Any television experience from movies to sports is only as good as the sound. Your LG OLED TV provides Cinematic Sound at Home with Dolby Atmos®. Dolby Atmos transports you with moving audio: crickets chirping all around, a monster roaring from behind, or a plane soaring overhead. In fact, its content creates a more detailed sound experience that appears to come from everywhere for a wonderfully realistic, immersive experience that puts you inside the story. *DISCLAIMER: *Dolby, Dolby Atmos and the double-D symbol are registered trademarks of Dolby Laboratories. Now it’s time to get serious. Once it’s in your home, cheer every play on, cry at all the best parts of the movies. Travel far while never leaving your home, and be mystified with immersive movies. When you relax and kick back, or cheer a team on and get fired up, this is the tech you need to support your love of the game and movies! Smart technology, that integrates into your smart life.Learn more about LG OLEDs at your local Best Buy. Lavishly live entertainment, sports and gatherings out loud because you know the best way to enjoy sports and movies on the big screen! *DISCLAIMER: Service limited to certain languages. Some features require 3rd party service subscription. Google Home and Amazon Alexa devices sold separately.